On a tight budget? 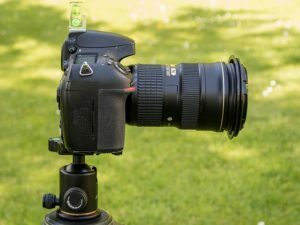 Want a cheap Arca-Swiss compatible alternative to the JOBY Ballhead X? The Andoer ball head could be the answer. To achieve this setup I started by purchasing some Gorillapod SLR Zoom tripod legs. On its own the SLR Zoom wouldn’t allow me to position the camera as freely as I’d like so I needed a tripod head to attach to the Gorillapod legs. I searched for solutions and found a handful of products. JOBY, who manufacture Gorillapods, make a product called the Ballhead X which is small, lightweight and, crucially, has an Arca-Swiss fitting. However it is an expensive product and I wondered if there were cheaper alternatives. I soon found the Andoer Ball head on Amazon for £14 (as of July 2017). I was skeptical about its build quality but its price and many positive reviews swayed me. I needn’t have worried as the Andoer Ball head turned out to be fine. 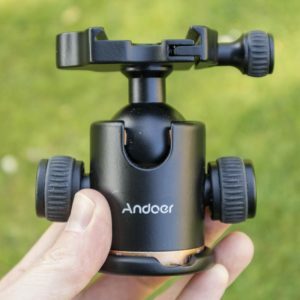 Key points about the Andoer are that it has a 3/8″ screw fitting making it compatible with most tripod legs, from Gorillapods to Manfrotto, Gitzo and the like. 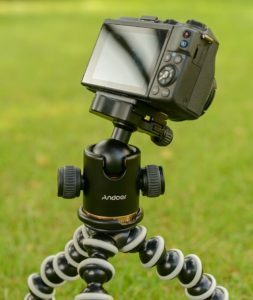 My initial tests showed that it worked perfectly with the Gorillapod SLR Zoom legs. The 377g weight of the Andoer head added to the 190g Gorillapod SLR Zoom legs made the whole setup 567g, excluding a camera. With the Canon M3 and 14-45mm lens attached it makes a compact setup; the ball head gives enough grip to hold the Canon M3 in any position. The head comes with a small screw-in Arca-Swiss style camera plate that works sufficiently well on a light camera such as the M3. It’s no match for an L-bracket but it’s reasonably good for the price. Two knobs either side of the head tighten the ball to lock its position. 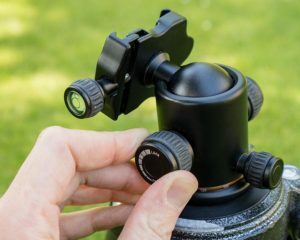 A third smaller knob can be loosened to allow the head to turn on its base – a crucial feature for creating stitched panoramic photos. The camera clamp includes two spirit levels. I should point out that the Andoer ball head is no match for a more expensive ball head from the likes of Really Right Stuff, Arca, etc. Its low price means that the ball isn’t machined to operate super smoothly nor hold heavy weights but that doesn’t stop it from being useful. The head has a maximum load of 8kg so there is plenty of scope for it to support a mirrorless camera or light SLR. Ergonomically, it suffers from having two knobs which must both be tightened to fix the camera in position. When using my Really Right Stuff ball head I use one hand to hold the camera while using the other to tighten the ball. To use the Andoer like this I’d need a third hand. The head doesn’t come with instructions so I’ve no idea why it has two knobs rather than one. I can only guess this setup allows for more pressure to be applied when both are tightened. How would the head fare with a heavier camera attached? I thought I’d try it by attaching my Nikon D800 fitted with a 24-70mm lens which weighs about 2kg in total. There was no point in testing this using the Gorillapod legs as they would collapse under the load. Instead, attaching the Andoer head to my Gitzo tripod legs gave a suitably stable base. I found this setup to be workable though only as a last resort. The double knob setup is hard work and while the head holds the camera in position it doesn’t have as much grip as I’d like. Each time I set the camera in position, when I removed my hands and let the ball head take the weight the camera slipped down a fraction. This isn’t good if you want to precisely position the camera. Criticisms aside, for this price the head is a bargain. I would be very happy using it with a light SLR or mirrorless camera. If paired with a sturdy set of legs it would make a fine tripod setup, though the weight rating of 8kg is rather optimistic! Note, the Andoer head also appears to be on sale under the Beike brand. As far as I can tell they’re exactly the same products.